Drawing power through a kundi connection proved too costly for a labourer in the EWS colony here when a fire caused allegedly by a short circuit in the illegal connection badly burnt his two minor sons and a son-in-law, besides gutting his one room apartment late this afternoon. Kuldip Singh, 3, and Lucky, 6, both sons of labourer Kartar Singh, are battling for life. While city residents are paying for their electricity bills through their nose, slum dwellers of Shaheed Bhagat Singh Nagar are enjoying power free of cost by stealing it. The Punjab State Electricity Board (PSEB) is turning a blind eye to the problem though residents have complained to it on numerous occasions. The Ludhiana Architects’ Association has expressed serious concern over the attitude of the US-based software company Auto Cad for accusing them of using pirated software. The bail application filed by Delhi-based businessman, Chetan Gupta, who was arrested in connection with the City Centre Scam, would come for hearing before Special Judge Gurbir Singh on June 2. Two persons were reported murdered in the city in the last 24 hours. Jagdish Kumar, an ice cream vendor was murdered with sharp-edged weapons by unidentified robbers near Jagraon bridge sometime after midnight. It is believed that he was also looted as no money was found in his cash box. The Central Jail authorities here have asked the city police to register a case against a man convicted under the NDPS Act and undergoing life sentence for falsely accusing another convict and some jail staff of tattooing ‘chor’ on his back. 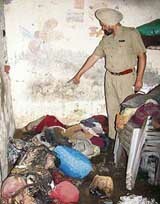 When Maya Nagar-based grocery shop owner Amrik Singh took on the might of a strong police lobby to get the cops punished, who murdered his son in January 2001, even his relatives forsook him. His neighbours turned their backs towards him. Witnesses turned hostile and politicians advised him to compromise with the killers of his son. 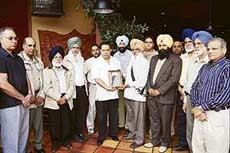 Radio India managing director Maninder Singh Gill honours Amrik Singh Gill in Surrey, Canada. After causing much hullabaloo with their claims to stick to the P Ram Committee’s deadline regarding the Common Effluent Treatment Plant (CETP) all that was done today in the name of inaugurating the plant was transportation of untreated water of a unit from Focal Point Phase-VI to Focal Point Phase-VIII where the plant is located. Demanding the cancellation of the Electricity Act, 2003, employees of the Punjab State Electricity Board (PSEB), on a call given by the Technical Services Union, held a dharna here today. The Bhagwan Mahavir Sewa Sansthan will hold a camp for the distribution of artificial limbs, crutches and wheel chairs to physically challenged persons free of cost at the Viklang Sahayata Kendra at Rishi Nagar here on June 3. State president of the BJP Rajinder Bhandari will inaugurate the camp while minister for tourism, jails, printing and stationery Hira Singh Gabria will be the chief guest. Bharti AXA is planning to diversify its portfolio from life insurance to offering a range of financial services including general insurance and mutual funds, vice-chairman, Bharti Enterprises, Rakesh Bharti Mittal, said here today. "By the second half of this financial we would come up with more financial services," Mittal said. The onion yield of 70 quintal from a half acre of land has not only taken people by surprise but has also set the vegetable market believing as only five onions can weigh 2 kg. Despite the instructions of Agriculture University to avoid the sapling of paddy crop, farmers have started ploughing the paddy crop. Sophie Dhaliwal has been crowned as Miss New Zealand Panjaban at an event organised by the NZI Culture Centre and Sabhyacharak Satth Punjab at the Telstra Pacific Event Centre, Manukau, New Zealand. An interactive session organised by the Ludhiana branch of the National Integrated Medical Association (NIMA) to mark "World No Tobacco Day" here last evening, called for creating a tobacco-free society to save the people from life-threatening diseases like tuberculosis, cancer and asthma. District health administration is observing the month of June as anti-malaria month. In this connection, an elaborate month-long programme has been chalked out to educate the people about preventive measures against malaria and other diseases of the summer season. Holders Punjab lads proved too good for Andhra Pradesh team, whom they overcame easily 14-7 to retain the title in the 25th Junior National Softball Championship that concluded at the Punjab Agricultural University ground here today. The unabated depletion of water resources, if left unchecked, would spell doom for Punjab's economy. These sentiments were expressed by director of research, Punjab Agricultural University, Ludhiana, Dr B S Dhillon. Notwithstanding the notice of suspension served by the district unit of SAD, Ajmer Singh Bhagpur, chairman of Milk Plant, Ludhiana, received a warm welcome in Milk Bar at Bija, near here, yesterday. Vice-Chancellor of Panjab University, Chandigarh, Dr R.C. Sobti, has nominated Dr Pawan Kaushal,senior lectuer in the postgraduate department of English of Government College, Ludhiana, member of the Undergraduate Board of Studies in English for two years in recognition of his services in the field of his subject.